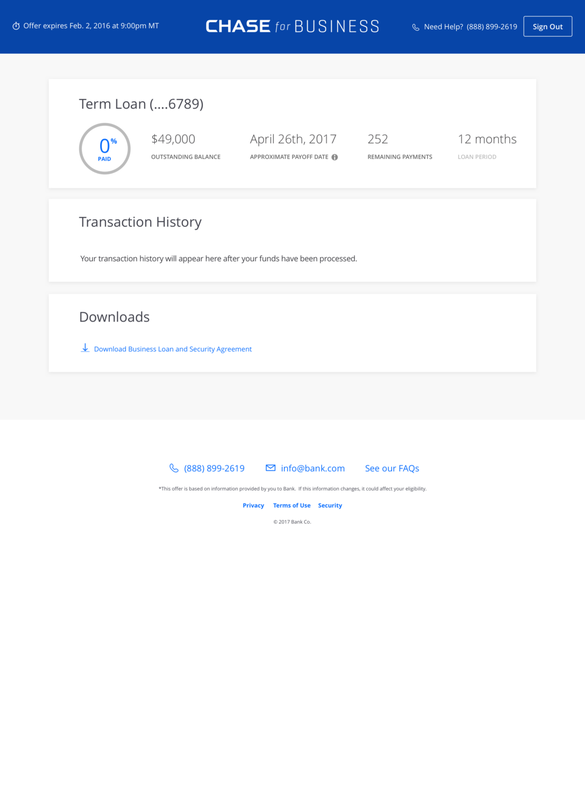 OnDeck is the world's leading online lender to small and medium business in the US, Canada and Australia having lent nearly $6 billion to "ma and pa" businesses. They're located on Broadway in Midtown. As Director of Design & User Experience, I have a small team of three (3) UX designers and two (2) user researchers. We're responsible for all the product design of our customer-facing sites (which we call the "public" site), the online application and all internal apps. Believe it or not, my first project at OnDeck was to redesign and rebrand the entire company. No small task, but I was up for the challenge. When I arrived, I discovered the team had stalled, focusing on sitemaps and wireframe navigation models. It wasn't moving forward. Our stakeholders are visual / brand orientated and my theory is that they needed some actual product design to give feedback on. We had a general idea of the screens we wanted to build: Customers, About, Home, Contact, Partners, and a few others. That comprised the core of the site we wanted to launch. I asked the team if we could adopt a proven process I used several times before: the one week scrum (sprint). We'd decide each Monday what we wanted to deliver that Friday and during the week we'd design, test, get feedback and iterate as necessary. Everyone thought this was a great idea so we got to work right away. We setup a whiteboard with 12 sprints written on it which was our rough outline for the entire project. We met every Monday and debated what we thought we should design that week. Then we got to it. Every morning at 10am we did a standup meeting and discussed what we got done and what direction we were headed. 1. Describe what you see here. 2. What does this company do? 3. What do you think you're supposed to do here? 4. How does this make you feel? 5. Would you recommend this site to a friend or colleague? These were just a few questions we asked, but with each round of user testing, we wanted to see if we were getting closer (or further!) from something delightful and different in a rather busy FinTech space. We had a tough task: we needed to explain our products and services, but did so in a simple enough way that almost anyone could understand (but pass legal scrutiny). Our customers are businesses looking for money. Some are desperate, looking for financing to help keep their business running. So we need to design very aesthetically pleasing experience that reduces their fear. Most small businesses have not heard of us so we also needed to show how long we've been around; how much we've lent, how trustworthy we are, and last but certainly not least: showcase customers like them who have succeeded in getting funding. Looking at our traffic metrics, we realized that mobile was a huge part of our audience. Like most sites, we wanted it to look as great on mobile as on desktop. So we worked on mobile first, then expanded the breakpoints to desktop. Our desktop designs looked pretty good on tablet so we worked with the developers to make sure everything moved the way it should as customers interacted with the site. Here's the desktop output, the result of months of work and a true team effort. We're really proud how it turned out. My design team and me are always trying to improve things and take the customer experience to new levels whenever we can. We had a summer design intern on the team, Gaby, and I set her out to explore new mobile experiences. Little did we realize that little experiment would take on a life of its own. But often major innovation comes from unlikely sources. Our big idea was to personalize the experience considerably and put financing quite literally in the palms of our customers hands. Research had shown that customers love their sales reps, and refer to them by name in customer reviews. So why not try to mimic that a bit in a smart way online? You grab your phone, and start answering a few questions about your business and its needs. Before you know it, you're engaged in a conversation with a smart, responsive "person" every step of the way, who is using your answers to help guide you through a process. As we started to put together screens we were struck at how solutions presented themselves, screen after screen. We knew we were onto something. It's not finished or even the final product, but you can see the direction we were headed. Here are a few screens for you to get a taste of the project. But mobile experiences are best experienced... on mobile. So open up your phone browser and enter the following URL and you'll be able to tap through the entire experience. It's by no means complete or pixel perfect. If you would have told me I'd be the Lead Product Designer on a major capital project for Chase bank, I would have thought you were crazy! But that's exactly where I found myself when asked to take over the project. Thankfully, it was an absolutely wonderful experience. 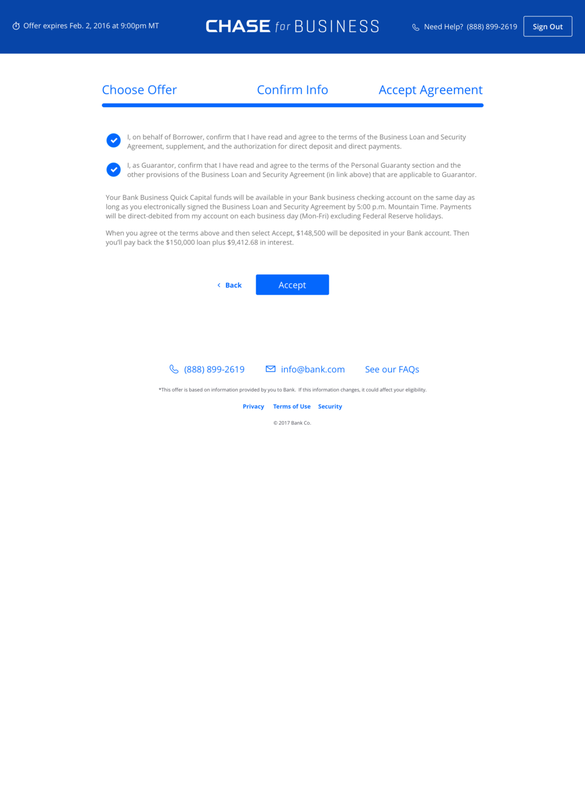 OnDeck had signed a major deal with Chase, powering their small business lending through a white-labeled site we control. It looks like Chase, feels like Chase, but its OnDeck under the hood, and our design team creating the user experience. We worked closely with the Chase design / product teams, and we all found it funny that my counterpart there was named "Shawn" spelled the same way. You can imagine the conference calls. We had a "Chase Shawn" and an "OnDeck Shawn." 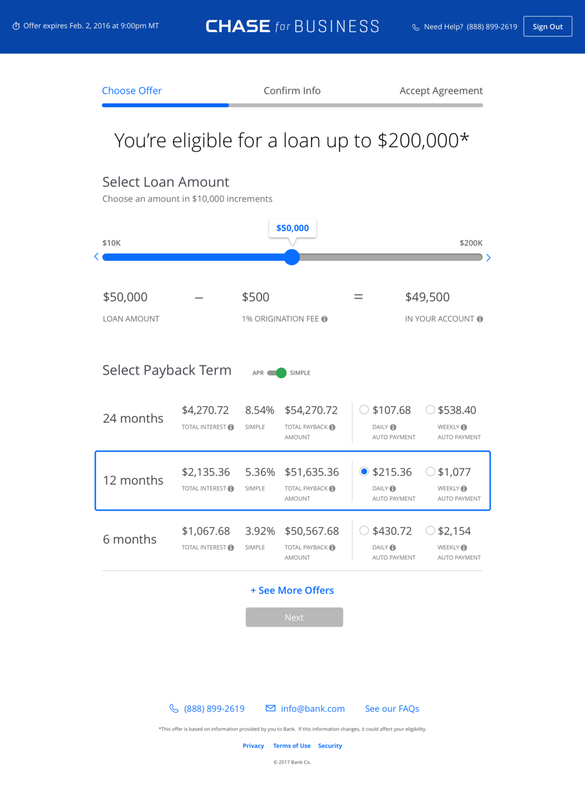 While Chase had some design guidelines, I pushed myself and my team to break the bold of boring banking sites, and do something lean, clean, and light. These are small business customers, so they're busy. They get a pre-approved offer and then have to check out. The entire process is only 5 steps. 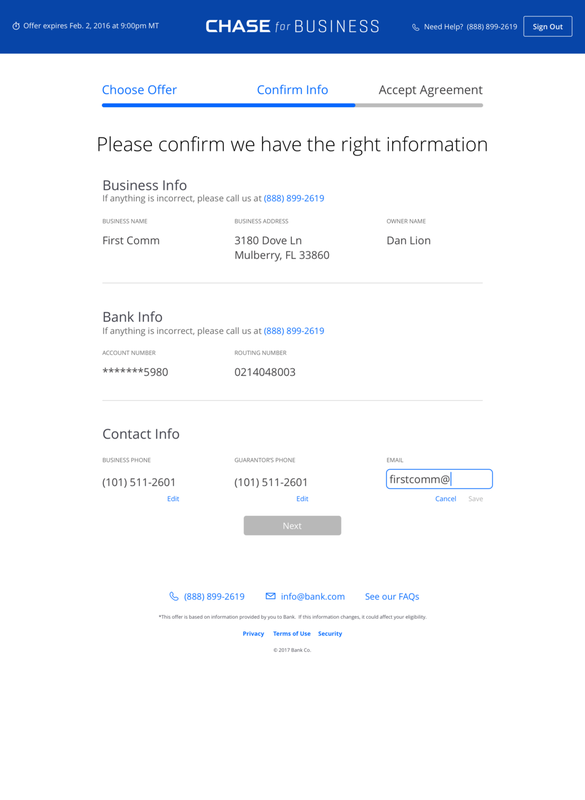 My continued hypothesis on user experience design when it comes to a customer flow is to minimize the amount you have to do on a given screen, and this was no exception. Chase wasn't sure, so we designed it all out and tested on customers. The preliminary results were an Net Promoter Score of 90! Chase was floored, expecting something closer to 60. 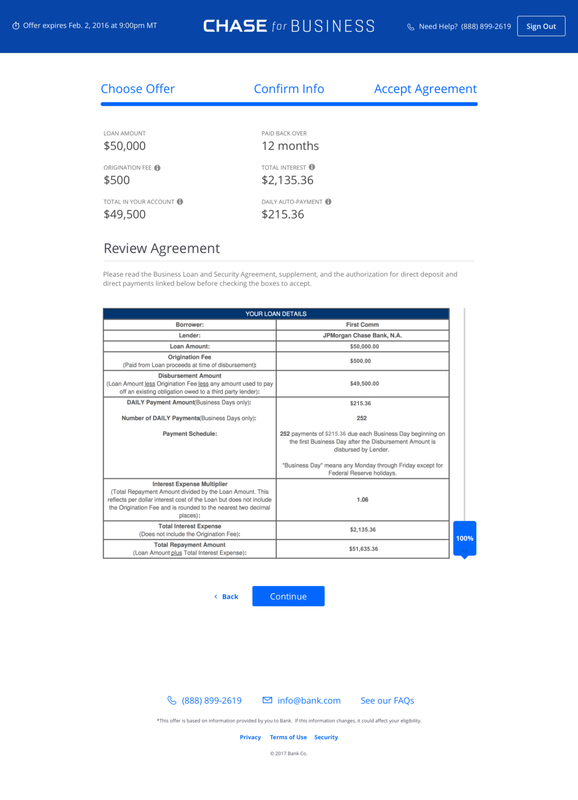 The legal department had some issues with the notion of separating the agreement and agreeing to it on different screens, but I was able to talk them into it by showing that there was no way to agree to it until you had scrolled and read it, because of the UX design of the screens. 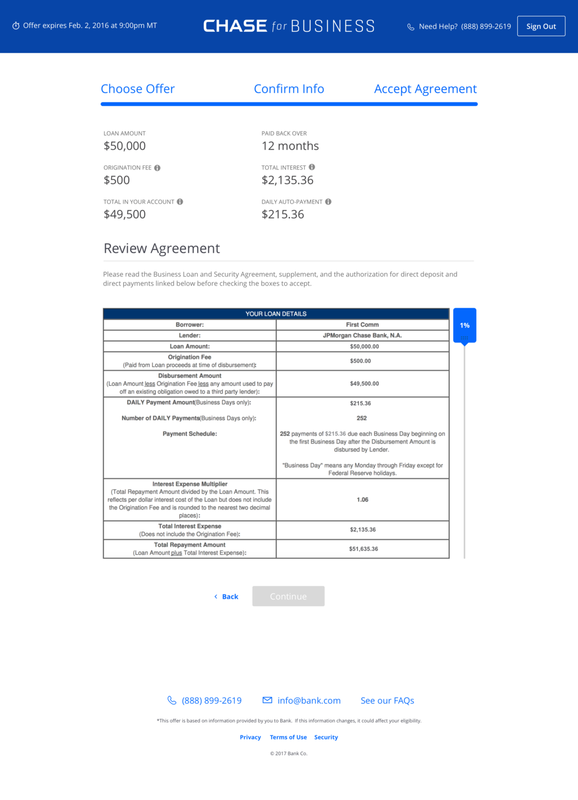 In previous iterations, customers would try to click agree before reading the agreement. We had to give them error messages showing why they couldn't do that. Clumsy. So by removing the agreement mechanism and moving it downstream, we elegantly solved the problem. After we submitted our designs, did some testing and iterations and finally presented our completed work to Chase, the feedback was overwhelmingly positive. So much so, in fact, that Chase has selected this project to demo at the Chase Investor Day event attended by thousands of their investors. How's that for design moving the needle? The desktop experience is responsive, loads quickly, and has clear affordances for what you can move and do. Remember the iPod and its famous scroll wheel? Bet you'd never see it used to select a $100,000 bank loan! But that's exactly what I did here. See, the scroller works great on desktop as a keyboard / mouse interface. But on mobile we're limited to as little as 320 pixels wide, which just isn't enough to span the number of increments (as low as $1,000). My buddy Erik Flowers at Intuit pioneered a really cool method for understanding not only how your customers experience your product, but what internal systems, people, and operations make that experience happen (for better or worse). I coached my research team and a UX designer on the Service Design Blueprint concept and asked them to tackle one of the harder operations OnDeck had. There was too much "tribal knowledge" where people who had been there a long time knew all these secret issues and they stayed trapped - and unfixable. Check out the final blueprint. This kind of process documentation was revolutionary stuff at OnDeck. As you can see, the emotional state of the customer is the most telling metric.